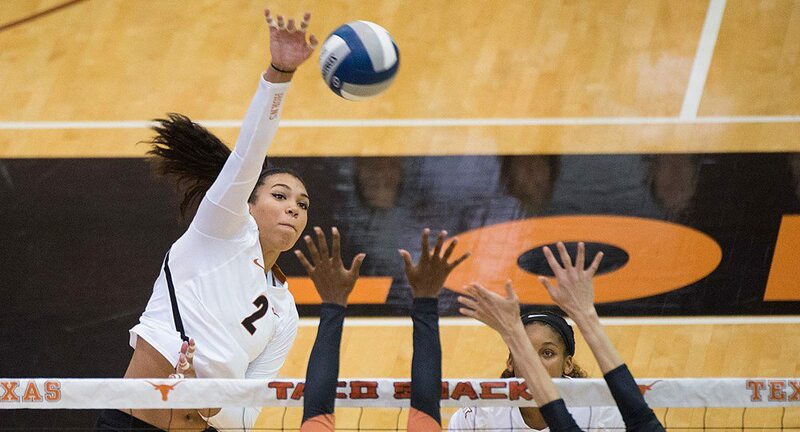 Junior outside hitter Ebony Nwanebu had 15 kills to help the University of Texas volleyball team sweep Texas Tech, 25-22, 25-14, 25-15 (photo courtesy of texassports.com). AUSTIN, Texas — For the first time since the University of Texas became the undisputed volleyball team to beat in the Big 12 Conference after the 2010 season, when Nebraska left for the Big 10, the Longhorns have lost the ability to control their chance to claim another league championship. The Longhorns can thank two five-set road losses in the past two weeks for that unfamiliar predicament. Between now and next Saturday, UT has to take care of its own business, win the rest of its matches and hope Kansas, which currently heads the league standings, loses at least once.